If you’ve been living...well, virtually anywhere on the planet, you’ve surely been hearing a lot about smart technology and artificial intelligence. It’s taking over every industry and domain, from the high-tech equipment used in summer blockbusters, to the everyday consumer tech you may have in your home. eufy will soon be bringing AI into the home security space, making your house smarter and safer than ever before. So, what’s this new innovation all about? Unfortunately, aside from the sneak peak in this picture, we can’t discuss any details or features just yet! But all will be explained next month, when our new Kickstarter launches! Let the speculation begin. Share your guesses below for a chance to win some PowerBucks. Who will be the first to correctly predict the big reveal? Leave a comment speculating about features, design, price, or anything else related to eufy’s mystery product. We’ll randomly choose 3 participants to receive PowerBucks. 2 winners will get 100 Bucks, and 1 lucky contributor will get 200. Winners will be announced on March 21st. Thanks for all the interesting inputs! I'm glad to know our product fits your majority of demand. Your winning bucks will be updated within 3 days in the account! A wireless outdoor camera system is what I would think this looks like. Weather proof enclosed system to allow year round outdoor use. Some sort of speaker system maybe for noise detection. Easily interface with alexa and google home would also be nice. Looks like an indoor camera with night vision and I suspect it will have face recognition and be able to alert you who is at your home etc. From this image, it looks sleek and classy. - some onboard storage or be able to link to a server for storage. Looks like a security camera (no doubt with motion detection) and as it has a mic hole I would guess a door entry camera or a version of monitor where audio would be required, such as child/baby safety etc. Some sort of IP camera.....indoor I would say. I've just got myself a Yatwin 1080p IP camera.....was hoping Anker would produce something like this as the majority that are available are pretty poor quality. Would be good to be able to compare the two side by side.....if it is what I think it is. I saw a Eufy IP camera advertised on my Instagram feed the other day, so I'm guessing it's that. If I recall correctly, one of its main features was it's ability to detect faces. This would be really nice to avoid the typical "motion alerts" other cameras throw any time the leaves rustle in the wind on a squirrel runs across the yard. I'm hoping for a sub-$100 price as well. I was gonna say the obvious as everyone else. 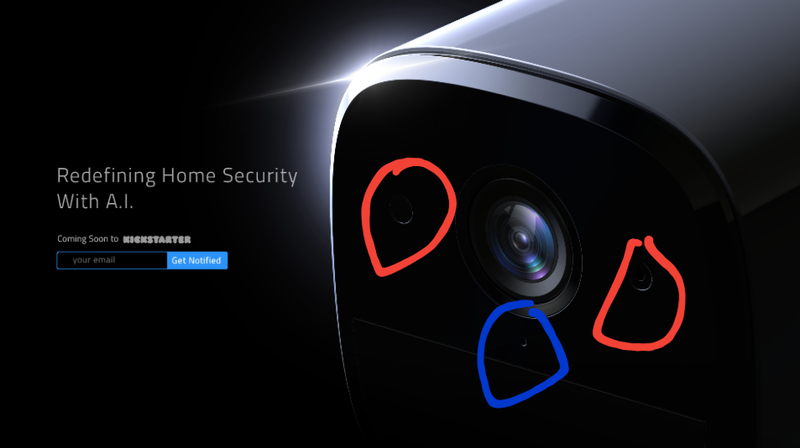 But I do see an IP camera that has facial recognition AND Tracking.....the camera sensors circled in red signify that it is capable of real time tracking and sensing. There is a microphone circled in blue to signify that it will have active recording. All of this paired with a eufy app for tracking and monitoring while amy where in the world. App driven for both IOS and Android. Full 1080P or better camera. option of battery or plug power source. It would have to be networked, waterproof, could be both mains and battery powered? As there are different holes beside the camera lens perhaps is used to detect people or movement. AI side, facial recognition, movement detection, auto alarm, and works with other Eufy products to activate e.g. lights and etc. Just received an email about the EVERCAM!!! US and Canada only? @AnkerOfficial are these Eufy products going to make it outside the states? I saw that and was totally bummed out by it! So many amazing products we are missing out on over here. Hopefully it's the original AnkerCam on steroids. My hubby loves his AnkerCam but unfortunately, it still needs a lot of work. A new AnkerCam with high resolution and better low light sensor would be awesome. I'm hoping that this is a surveillance camera with motion sensor, free cloud storage, higher resolution recording, etc. We've been hoping that Anker would make another surveillance cam. Maybe this will be it. Can't wait. .. notifications if camera is set off. .. would have face recognition via the app. Upload a clear faced portrait photo of the person. I'd say, similar but better than a trail cam (the sort hunters/nature folk use). Would have a price structure. Where 1 model isn't flir but has lights that come on, but another model does have FLIR etc. I am thinking a Nest Cam IQ competitor ($300-$350), so honestly doubt it will be sub-$100, but more in the $100-$200 range. Anker's options are often on the more affordable side of things.